Recently I was interviewed for an article about trends in kids rooms. (Check it out! It’s a good read.) To summarize: trends in kid spaces mirror ones in adult spaces. Parents are the ones making decorating decisions, after all, at least for the youngest set. 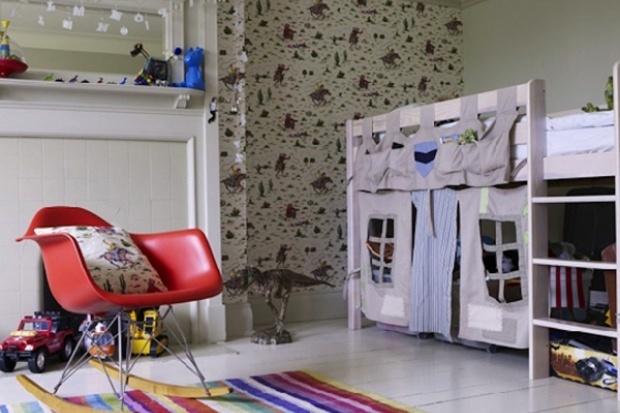 What I find most interesting about kids’ rooms, however, is how they differ from spaces intended for adults. Designing a space for children is about more than using their favorite color or letting them pick their bedding. It’s about creating a room that takes into account their size, their mobility, and their interests. It gives them space to express themselves, and a place to feel both comfortable and inspired. Here’s how to do that. If you’re designing a room for kids, they should feel comfortable in it. So be sure to include chairs and a table that are just their size. This goes for storage, too. Some parents worry about giving their kids easy access to their toys. They think the kids will run riot and toss the toys everywhere if they can reach them themselves. Those parents are probably right. But the kids can’t put the stuff away if they can’t reach where the toys are stored, either. 2. A special, kid-sized, comfy place. Kids love to burrow. Why not give them their own, perfectly sized place to do so? This can be a nook, like this one made inside of a shallow closet. Or a tent. Our toddler son loves the one we got for him on Etsy. I sent the seamstress fabric to customize it the way I wanted. It could also be a corner with a comfy chair. Or a play area under a lofted bed. This is a great idea for a small room, because it uses space so effectively. And the play space created under the bed is especially cozy. Themes are great for parties, not so much for rooms. I think they tend towards cutesy, and kids tire of them quickly. But by all means, go bold with the decor if you like. My favorite rooms are eclectic and personal, both for adults and kids. I like a space that leaves room for the child’s (or children’s) personality to show. 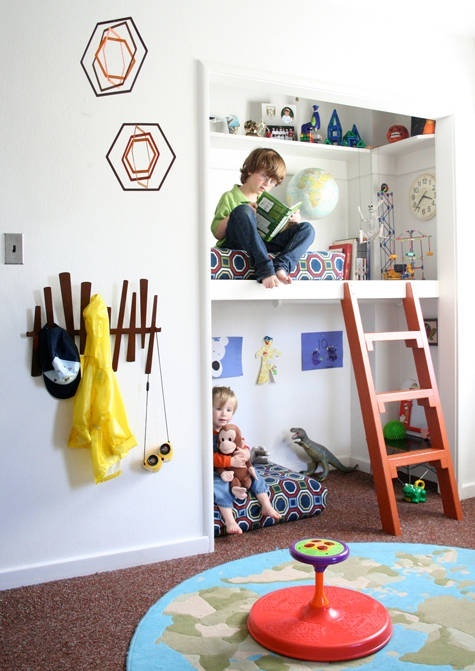 I especially love this room above, for a set of boy and girl siblings. It’s cheery without being saccharine, and can easily age up as they grow. This room (actually another view of the last one shown above) is for elementary school aged children, and features one of my favorite items for homes with kids: indoor/outdoor rugs. They wear like crazy and are extremely easy to clean. They’re also inexpensive, and easy to pick up in bright colors. They’re an ideal choice for a room with people who engage in messy pursuits, like painting or playdough. A really worn Persian rug can work well for a kid's room too, as it won't show dirt easily, and will tend to look better with age. For an infant, however, something softer is a better choice. I love a sheepskin rug in a nursery. They’re so soft, and there’s something darling about a baby on a fur rug. Darn if I know what it is. What I love about this room above is how it mixes sophisticated elements (the car photos) with purely kid items (the toys). 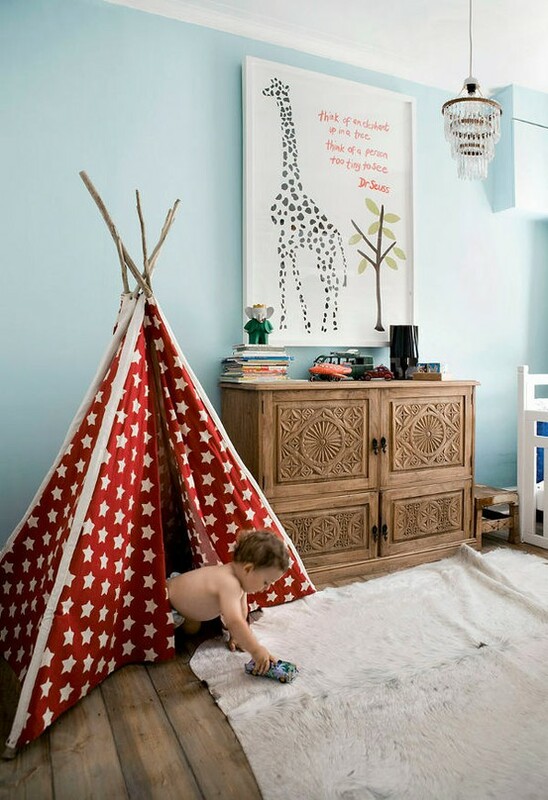 There’s nothing wrong with elevating your kid’s taste through their decor. You’re still incorporating their favorite subject matter, after all. You’re just using it in a different form, which makes the whole room more chic. And you know it’s never too early to introduce style into your kids’ lives.